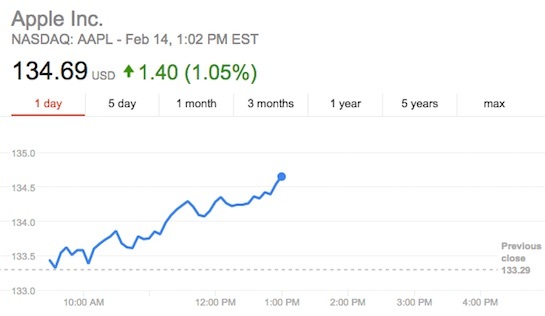 Apple is having a good Valentine's Day, as its shares traded above $134.54 today, eclipsing a previous all-time intraday high set in April 2015. Apple's market value has now surpassed $700 billion, making it the world's most valuable company by a sizeable margin. Google parent company Alphabet is second largest with a market cap of around $575 billion, followed by Microsoft at around $500 billion and Berkshire Hathaway at around $412 billion. The milestone comes just one day after Apple's stock recorded its highest closing price ever of $133.29 on Monday. Following Apple's first annual revenue decline since 2001, its stock been steadily rising over the past four months, buoyed by record-breaking earnings results at the end of January. When adjusted for a 7-for-1 split in June 2014, Apple's stock is trading at roughly $942, approaching the $1,000 milestone that was considered wishful thinking when some analysts predicted it years ago. Apple is also slowly but surely on track to become the world's first trillion dollar company. Apple analysts Brian White of Drexel Hamilton and Steven Milunovich of UBS, and former analyst turned venture capitalist Gene Munster, are among a larger group of observers who believe Apple's stock remains undervalued and is likely to rise. AAPL is up over 50% compared to its 52-week low of $89.47 in May 2016. Apple stock price... too high, low or just right?